HistoryConnects teams up with Skype in the Classroom! 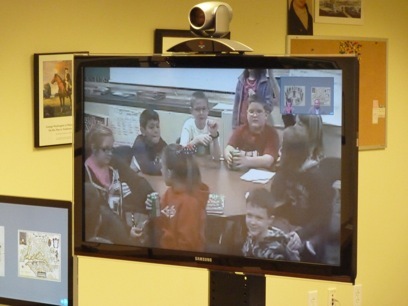 Late last fall, while preparing for a HistoryConnects program for a school in Washington, D.C., I found out that the school requesting the program didn’t have the necessary interactive videoconferencing equipment. They were hoping that we would still be able to deliver some form of the program via Skype. With some quick modifications, I was able to deliver a program that met their needs, but I was left wondering how many other schools were interested in our outreach programs but were also limited by the lack of access to high-end technology. How many classes were using Skype as a means to expand the regular curriculum? After doing some research, I found that Skype had recently developed a platform specifically designed for linking classrooms via technology. Skype in the Classroom (SITC) is a consortium of nearly 50,000 educators from more than 200 countries who are bringing collaborative educational experiences to students around the globe. There are nearly 50,000 educators from more than 200 countries who participate in Skype in the Classroom. This January the Virginia Historical Society became one of the official international partners of Skype in the Classroom. Through this partnership we share two programs a semester and offer a number of free presentations to schools all over the world. In less than a month we’ve received dozens of requests from schools. Last week we conducted our first SITC program with a 4th grade class in Marengo, Iowa; and we’re currently scheduling programs with schools in Kodiak, Alaska, the Philippines, the Sudan, Indonesia, and England! In conjunction with the SITC partnership, we’re excited to make all of HistoryConnects programming available via Skype. We recognize that technology is fluid and that the ways that we share our collections with audiences will change over time. We’re happy to be one of the first major content providers to make all of our distance learning programs available to schools and organizations without traditional videoconferencing equipment. Now we’re able to share live, interactive learning using basically an Internet connection and a web camera. A fourth grade class in Indiana takes part in an IVC program. Interactive Videoconferencing (IVC) remains a huge part of HistoryConnects, and the majority of distance learning continues to take place through this medium. However, HistoryConnects has expanded from just being IVC programming to include all ways that we at the Virginia Historical Society are able to share history through technology. One of our strategic objectives is to connect more people to our past and share our treasures with a wider audience. HistoryConnects is helping to expand that audience nationally and internationally. Evan Liddiard is Senior Education Specialist at the Virginia Historical Society.